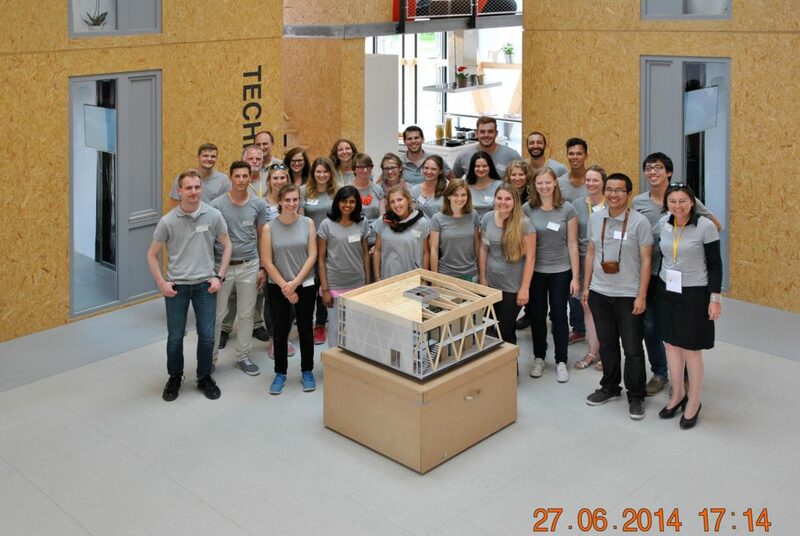 In the first phase of the research project Energy-Plus and Modular Future Student Living, the goal was to develop and realize an innovative concept for student housing, which would have its premiere at the Solar Decathlon Europe 2014 in Paris/Versailles. In its second phase since the end of 2016 after the reassembly in Frankfurt am Main, the building serves as a LIVING LAB for twelve students as part of an energy and social scientific monitoring period. The design task specified that an innovative, sustainable housing cluster for up to ten student residents was to be developed. This housing cluster was to have a high architectonic and energy quality, and would be erected on a grid with sixteen-meter-square plots as a form of “ideal city” in the Versailles palace gardens on the occasion of the Solar Decathlon Europe 2014.The goal of the design was therefore to develop a spatial element—cubicle/module/unit— which could be prefabricated and then transported to the competition location. In addition to the fundamental technical parameters of economic efficiency and transportability, the examination of modular construction and minimal floor plans was of central importance. The average very high space requirements for housing in Germany were to be questioned. Creativity was expected in the development of floor plans with high flexibility and transformability. The lightness and intelligence of the construction and the sensible joining of the building envelope, openings and supporting structure were important specifications, which were to be developed already in the concept phase. Living within a minimized floor plan requires the questioning of conventional images of furnishings and use (living, working, sanitary facilities). The integration of technical systems into the floor plan and energy generation systems into the façade, which had been practiced frequently in day-to-day academic work, as well as the balancing of active and passive measures within the building and energy concepts, were essential components of the solution. The aim was to achieve the Efficiency- House-Plus (Active House) energy standard. 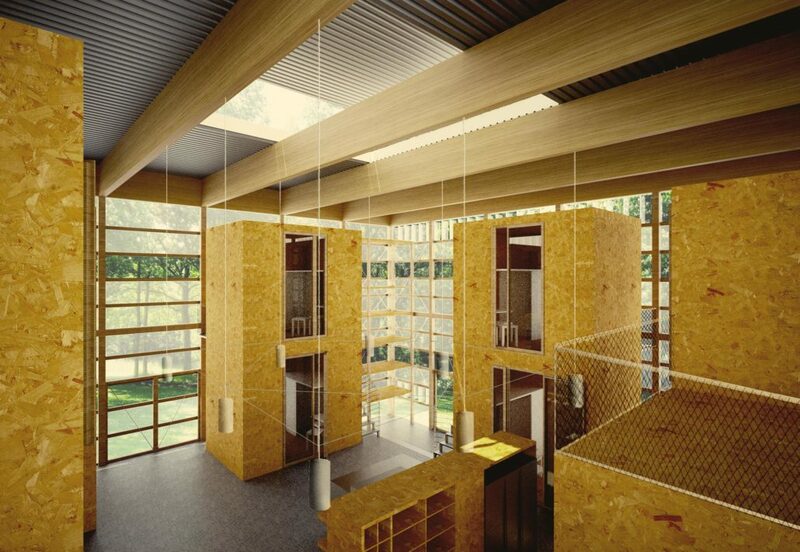 The original plot on the Solar Decathlon Europe 2014 competition site in Versailles was characterized by three different urban boundary conditions, which needed to be addressed in the conceptual solutions. To the north, the sixteen-by-sixteen meter cluster was oriented towards the main access route of the Solar Decathlon promenade, along which the competition submissions were lined up like a string of pearls. Opposite the front face of the building was an empty space in the grid, an interior open space, which was reminiscent of a smallscale local square, while the two flanks had to deal with questions of proximity and distance, density and communication, as determined by the close proximity to the neighboring clusters. In the course of the event planning, the realization of the solar city had to be abandoned by the organizers; the project was moved to a new location which was clearly visible at the entrance of the southwest flank of the site. The starting point was an arrangement of ten modules. The design was arranged so that additional elements could also be planned. The size of the individual modules could be selected freely; the only limitation was the ability to transport the module by truck, which had to be considered from the outset. Even the divisibility of individual modules—if structurally sensible—was a possibility. For the Solar Decathlon, each module should offer at least one shower, one toilet, one living/sleeping area and a kitchenette for three to four residents. 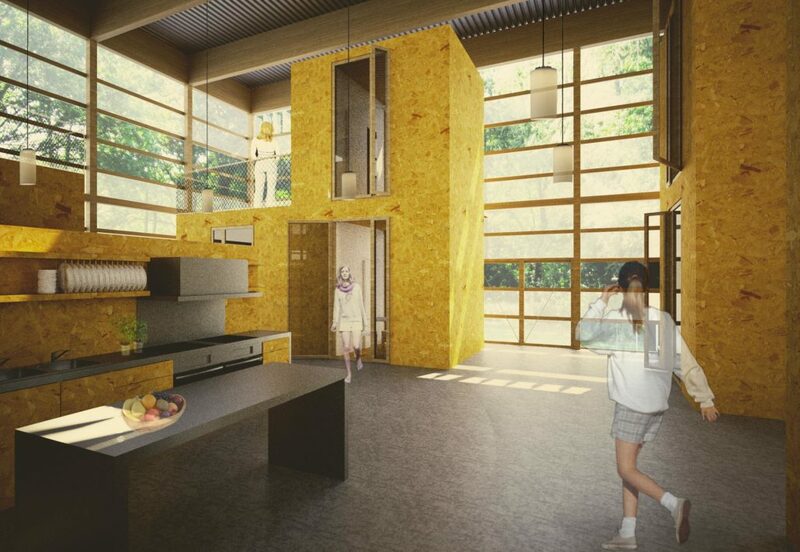 The kitchenette could be omitted if a common cooking area was planned as an alternative. Each cluster could have a maximum of two aboveground stories, in accordance with the monument protection guidelines concerning the visual axes towards the Versailles palace. Roof terraces, roof gardens and energy generation systems on the roofs were permitted. In the interests of a conceptually open approach, the surface area dedicated to the individual functions was not prescribed. Each module should, however, be designed for a fully-featured use by one person for several years. 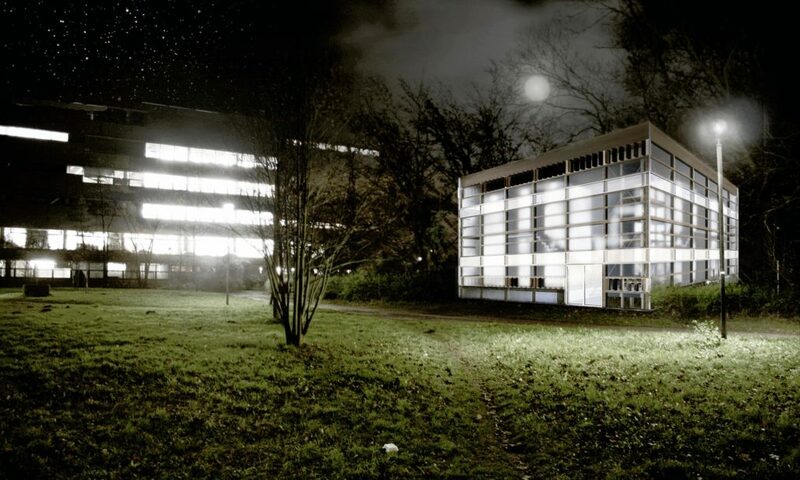 The project “Dorf im Haus” (“Village in a House”) possesses a strong and emblematic central theme, which formulates the student housing in Versailles and at Lichtwiese in a spatially poetic, individual, experimental and technically simple way. The orientation towards a low-budget aesthetic is convincing for the uses and the spatial variety gained by the concept. The jury would like to see a clear decision with regard to the materialization of the building envelope’s construction, which corresponds to the fundamental concept of the design, namely the combination of simplicity and ambiguousness. The individual tower modules become coherent through the stairs, which are still too narrow, but which are positioned in a slightly too small, but strategically well-used intermediate space. The jury recommends thoroughly examining the interior settling and checking the balance or tension between filled and intermediate spaces undertaken in order to create a coherent overall space. 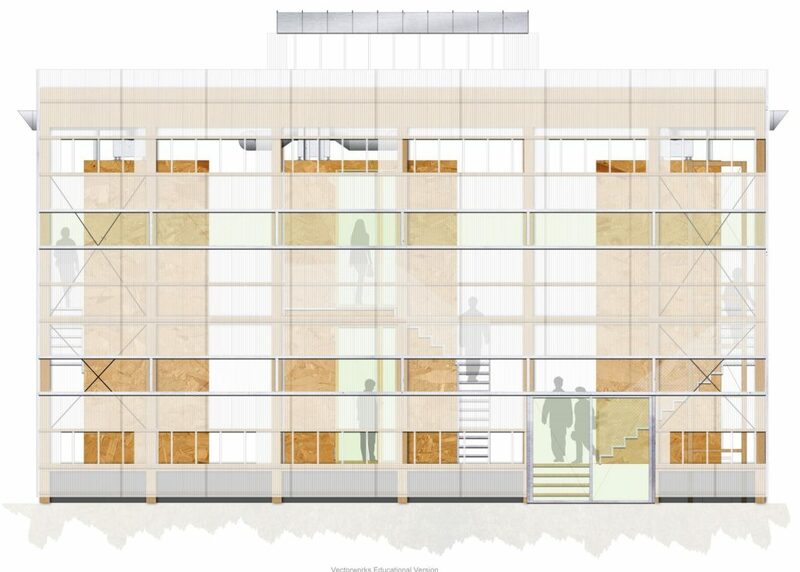 The interior facades of the living module could interact more diversely with the common interior space through interventions in the building envelope. The communal modules still feel bulky. It would be possible to integrate certain functions directly into the common interior space. The tower element could be configured as a scaffolding and thus provide greater transparency and a larger variety of uses. The project features a very experimental and clear basic approach which should be developed further. 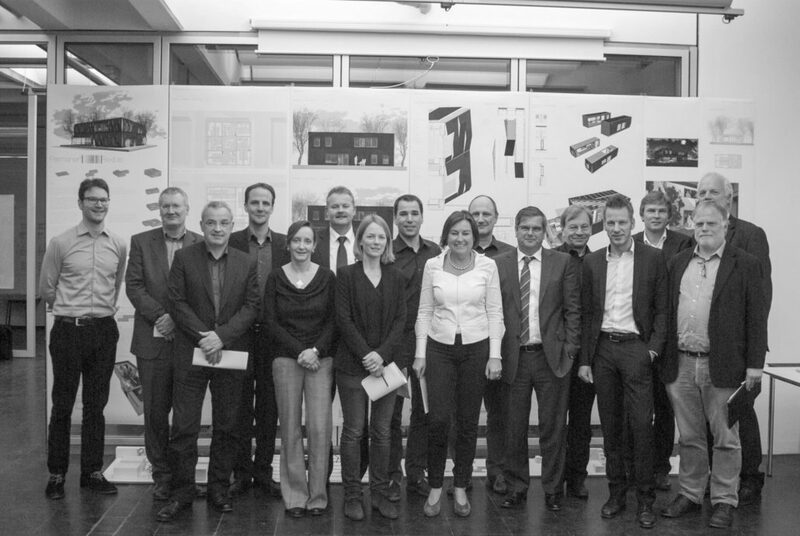 From the beginning of February 2014 onwards, directly after the competition decision, the design and construction of the winning project “Village in a House” was intensely reworked following the advice of the jury; this took place parallel to the design, permit and implementation planning phases. Spatial key points like the position and dimension of the cubes and the staircases were worked out in full detail. The functional areas, which had been schematically represented or in some cases were even missing in the competition design, such as the kitchen, entryway, terraces and the gallery level, were precisely defined. building preparation for Versailles including construction site logistics. The small groups each started with a clear thematic goal which was agreed upon within the team, and which included comprehensive research of the relevant scientific literature, above all about example projects and the state of technology and research. The results of this work were presented, discussed and coordinated by the students at weekly jour fixe meetings in the common work room in order to ensure that everyone was up-to-date and to coordinate the planning contributions. This made it possible for the students to see all of the aspects of the project and understand connections between them. The selected work structure corresponded to the teamwork typical in architecture offices. In contrast to a purely theoretical teaching exercise, the transdisciplinary cooperation with highly-qualified partner offices in structural planning, building services and preventative fire protection expanded the knowledge that the students were able to gain to include all of the project-specific details and their connection to one another. In order to make the individual results available to all the students at all times, a project platform was set up, in which all of the planning documents, for which a differderenentiated plan coding system was developed, were accessible. The establishment and use of work tools in planning processes was critical in order to reach the project goals with regard to quality and deadlines, and required discipline and reliability from the team members. Under the supervision of the instructors, the students developed a differentiated staffing schedule, lists of project participants, planning lists with personal responsibilities, structures for the approval of plans and schedules. In addition, the background documents and requirements for the permit process and the applicable DIN norms, which are usually taught in a way that is rather abstract and not application- oriented, were analyzed; their content and requirements were integrated into the planning. After returning from Versailles, the TU Darmstadt found two more strong cooperation partners for the reassembly of CUBITY in Frankfurt am Main: the consortium Nassauische Heimstätte / Wohnstadt, and the Studentenwerk Frankfurt. The managing director of the consortium Nassauische Heimstätte / Wohnstadt made an attractive urban site in Frankfurt am Main/Niederrad, Adolf-Miersch-Straße 46, available to the CUBITY project for three years. The Studentenwerk Frankfurt am Main took over the daily operation of the LIVING LAB for the second research phase. 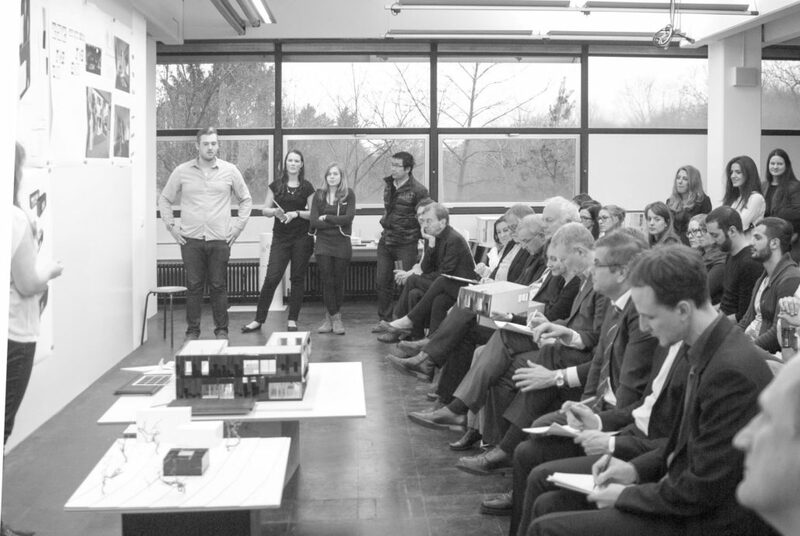 In October 2016, the Deutsche Fertighaus Holding AG completed the reassembly of CUBITY in Frankfurt am Main and the students moved in, thus beginning the second, sixteen-month-long research phase in the LIVING LAB. At the end of October 2016, the opening ceremony for CUBITY took place with all project partners, sponsors, project planners, students from the Solar Decathlon team, neighbors and the Hessian Minister for Economics, Transport and Regional Development, Tarek Al-Wazir attending. In the middle of November 2016, the first generation of residents moved into CUBITY. This first generation of student residents includes three male and eight female students from seven different disciplines and the social scientist Moritz Fedkenheuer, who will conduct research on the project during the second phase. Parallel to the research at the LIVING LAB in Frankfurt am Main, a functional modification of CUBITY as a FOUNDER LAB for innovative fields of work is also taking place. Currently, a new district called Hubland is being realized in Wurzburg on a conversion area which will be the location of the 2018 state horticultural show. Extension buildings for the University of Wurzburg and housing are being constructed on the 135-hectare large site. The FOUNDER LAB is being constructed on the central square in collaboration with the owner (the city of Wurzburg), the future user (the Innovation and Founder Center, IGZ) and the TU Darmstadt (Prof. Anett-Maud Joppien). Through this step, the adaptability of the CUBITY concept, which was planned purely as a housing project to date, will be tested for use as an experimental working space for young founders. The goal is to provide an inspiring and team-oriented spatial structure, which optimally and individually supports the implementation and further development of innovative digital business ideas into initial prototypes for IT founders and start-up companies through architectural means. It is important and possible, in particular during the founding and orientation phase, to support creative processes and specific ways of working through unconventional spatial proposals, thus furthering the success of the founding venture. The founder laboratory organizes spaces for prototype workshops, start-up offices, co-working, recreation and communication in a two-and-a-half story walk-in spatial sculpture which opens up into an eight-meter high, bright and open hall. Through large-format partitions in the form of sliding doors and curtains, the individual usage areas can be separated as individual rooms for concentrated, private work or opened up into a large common area with numerous co-working areas along the façade. This flexibility satisfies the requirements posed by changing work constellations between individual tasks and teamwork, as well as manual work on prototypes. Aspects and materials which lend a comfortable and homey atmosphere and the types of free furnishing reflect the blurring of the boundaries between living and working which are typical of this work phase and make it possible to create spaces with various characteristics, including for withdrawal and relaxation. 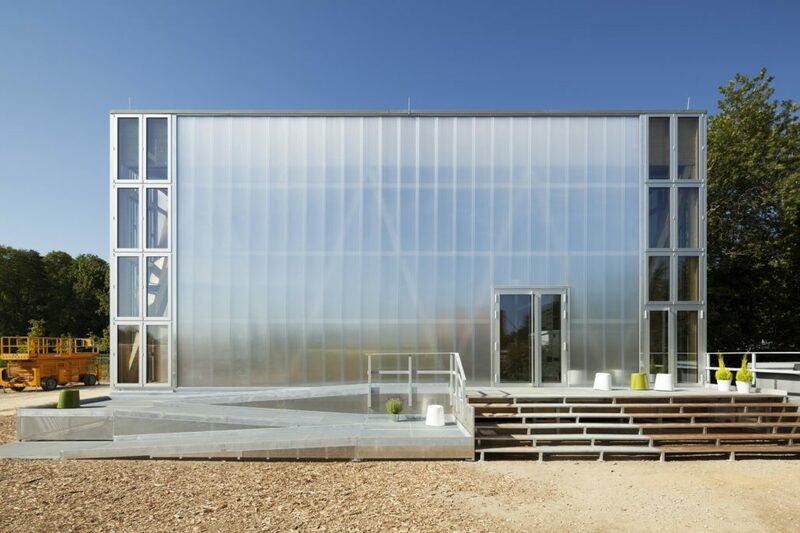 The translucent façade encompasses the various showplaces in a calm, bright, large-format form and lends the founder laboratory the striking character necessary to act as a landmark in the large-scale open landscape of the state horticultural show.